Team Durango Flex Brace System for DEX410 « Big Squid RC – RC Car and Truck News, Reviews, Videos, and More! Got a Team Durango DEX410 and want to add a little extra tune…age? 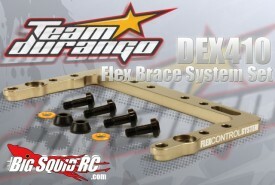 Check out the new Flex Brace System and dial in the rear chassis flex on your bad boy racer. A CNC’d aluminum brace mounts to the side rails of the vehicle and allows you to adjust the flex of the chassis by tightening down the mounting screws. Very sweet for the serious racer looking for an edge. Make sure you hit up Team Durango’s website for more info!